WASHINGTON (CNN) -- Is there popular support for a Michael Bloomberg presidential candidacy? The latest CNN-Opinion Research Corporation poll released Monday has the answer: Yes -- a surprising amount. New York Mayor Michael Bloomberg insists he's not running for president. "We even have two people from New York who are candidates for president of the United States," Bloomberg said. "I'm not sure the state needs a third." One New Yorker, former Mayor Rudy Giuliani, is the national front-runner for the Republican nomination, with 30 percent support. Undeclared candidate Fred Thompson is now tied with John McCain for second (19 percent for Thompson, 18 percent for McCain). Among the second-tier candidates, New Mexico Gov. Bill Richardson had 5 percent support; Senate Foreign Relations Committee Chairman Joseph Biden of Delaware, 3 percent; and Ohio Rep. Dennis Kucinich, 2 percent. Connecticut Sen. Christopher Dodd and former Sen. Mike Gravel of Alaska each had less than half of 1 percent support. The margin of error for the Republican poll is plus or minus 5 percent. The margin of error for the Democratic poll was 4.5 percent. Pit the two front-runner's against each other and what do you get? A very close match -- Clinton 49 percent, Giuliani 48 percent. Is there any room for Bloomberg? Maybe. The New York mayor does have a message: The country doesn't need more division. "It's my perception that government at all levels is becoming more partisan rather than less," Bloomberg said. Formerly a Democrat, Bloomberg has been elected twice as a Republican and recently just declared himself an independent. That's fueled a week of speculation about a run for the White House. "I am disappointed he left the Republican Party. I have no idea if he's running or not," Giuliani said. What does the public make of Bloomberg? Forty percent of Americans have no opinion of him at all. Among those who do, the balance is mildly favorable (37 percent favorable, 23 percent unfavorable). And views are about the same among Republicans, Democrats and independents. Polls taken earlier this year showed that if Bloomberg ran for president as an independent, his support would have been in the single digits. With all the new attention since his party switch, Bloomberg's support seems to be on the rise -- 17 percent in a three-way contest against Clinton and Giuliani. That puts Bloomberg in third place, but 17 percent is still an impressive showing for a candidate who's not even running. Seventeen percent nearly matches the 19 percent of the vote Ross Perot got the first time he ran in 1992. 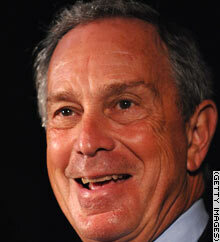 Even if he doesn't win, some people think Bloomberg could affect the outcome of the race. "If he runs there will be two liberals in the race versus one Republican. So unlike the Perot phenomenon that really hurt Republicans, this has a chance to hurt Democrats," Republican strategist Scott Reed said. That's not happening yet. Right now, Bloomberg would take votes about equally from Hillary Clinton and Rudy Giuliani, and the outcome would still be close (41 percent for Clinton, 38 percent for Giuliani). Keep in mind that Bloomberg is not well known nationally. If he were to run, he could spend a lot of money defining himself to voters across the country. But the CNN-ORC poll shows that a lot of voters are open to a new choice. New York City Mayor Michael Bloomberg speaks at a Manhattan event on June 11.